We fly off in many directions. Every now and then in life, there are certain topics that just seem to become sticky. For me, this has been space recently. I listen to a podcast that weekly relays news about Mars, I recently read The Martian, and then I listened to an amazing episode of Song Exploder about the song “The Commander Thinks Aloud” which was about the falling apart of the Space Shuttle Columbia. The other night, I drove with a friend out of the city and into pure darkness and just stared at the stars a little. When these topics start to marinate and invade my brain a good bit, I suppose the only logical thing to do is let them leak into my writing too. There are a lot of amazing things about space travel—I’ve written on them before. The infinity of the world beyond us is a simultaneously terrifying, humbling, and awe-inspiring thing. Something I’ve been pondering more recently though is how space is this strange paradox of both distance and connection. We send adventurers out into the great beyond, far from us, but their livelihood still depends on their connection to us. We throw them out into infinity, but they are still within reach. The true feelings of distance and remoteness come when we lose that connection, and consequently connection simultaneously becomes control. 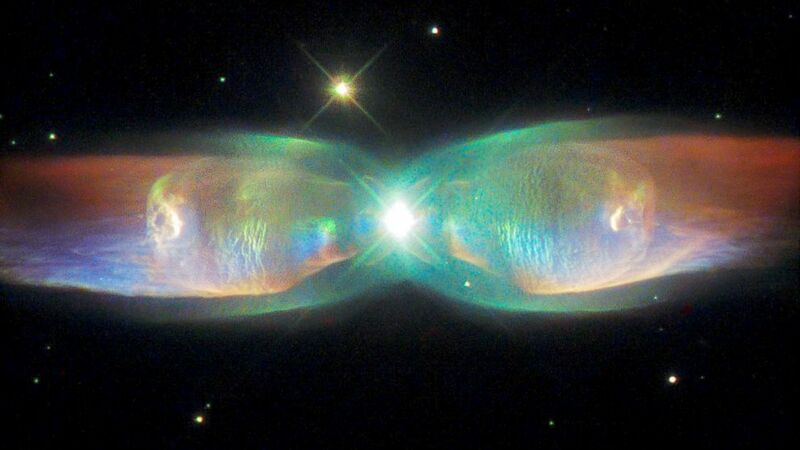 The Twin Jet Nebula, recently captured by the Hubble Telescope. Space, right? There is something incredibly unnerving about disconnect. It can manifest in a variety of ways, and I think we feel it even more acutely because of the ease of communication that comes with things like, oh, the Internet. My friends, family, and complete strangers are generally only a few taps away. But when distance causes the cell signal to drop, that lifeline is no longer there. There is also a shift to the immediacy of the moment, a forced presentness. I imagine being in space is like being tugged between those two extremes, but even more violently. There’s value in both—the mindfulness of an unconnected moment and the security of being tethered to the world around you. It’s finding that balance that seems to be the particularly tricky part.